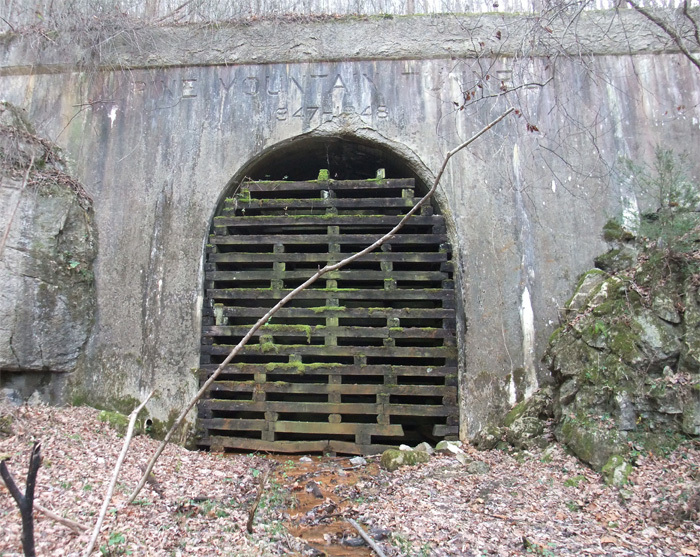 Anyway, I thought I’d posted this western portal. I hadn’t. Error corrected. First of all, Loyall Yard is pretty big. To get a look at it in its entirety, check Google Earth at 36.85470, -83.34902. The yard was built by the L&N in 1920 and originally had numerous tipples, a turntable and many other structures. 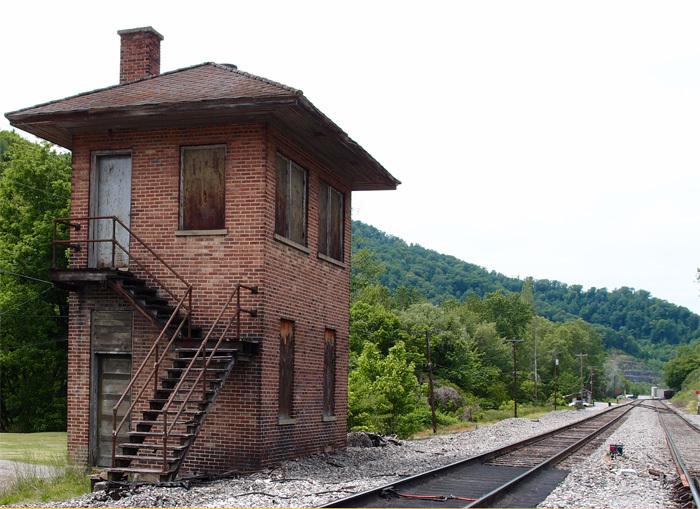 The town of Loyall was once known as Shonn, which is local slang for “railroad siding” (Wikipedia). The yard and town are protected from Cumberland River flooding by a flood wall and gate. This structure, probably a control point of some sort is just east of Loyall Yard and is abandoned. 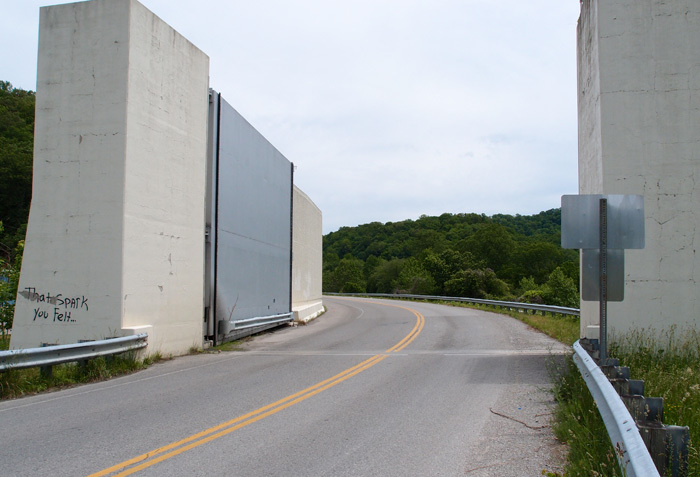 This is the flood gate on Highway 314 (the “Jerry Chestnut Highway”) coming into Loyall (this is looking east, away from Loyall). This is a bit of Loyall Yard. 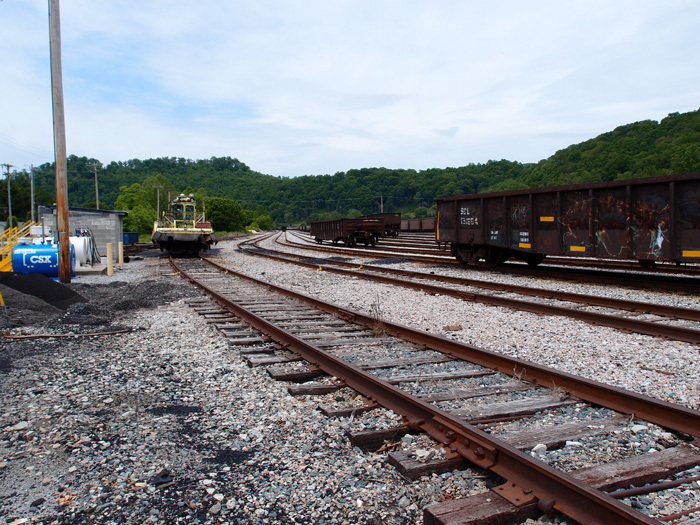 The turntable used to be over on the right, past the row of hoppers. 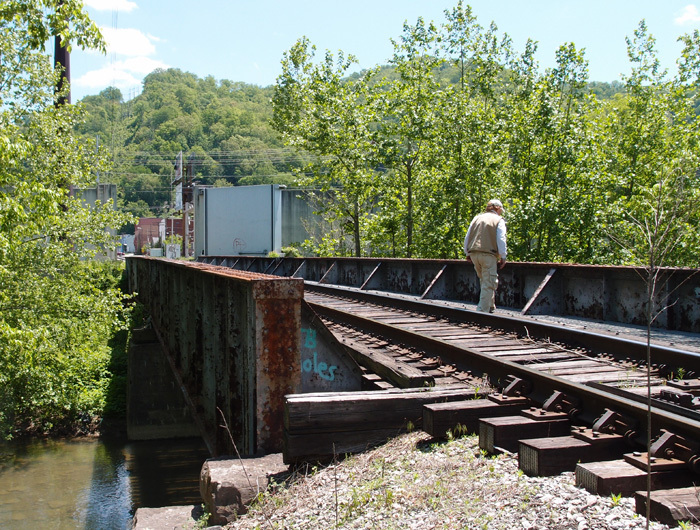 This solidly built double-track 1925 Fort Pitt Bridge Works (Pittsburgh PA) structure spans the Cumberland River just west of CSX’s Loyall Yard. 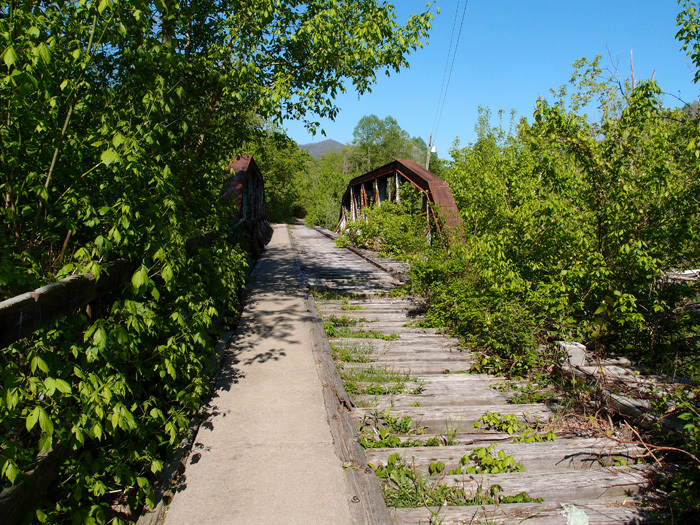 The bridge, in three sections, all box trusses (for a total of around 410′ in length), is at 36.85093, -83.36837. It’s on an active line that winds on into Pineville. This view is looking more or less west. To give you a sense of scale, that’s my buddy standing in the second section on the right hand side of the tracks. 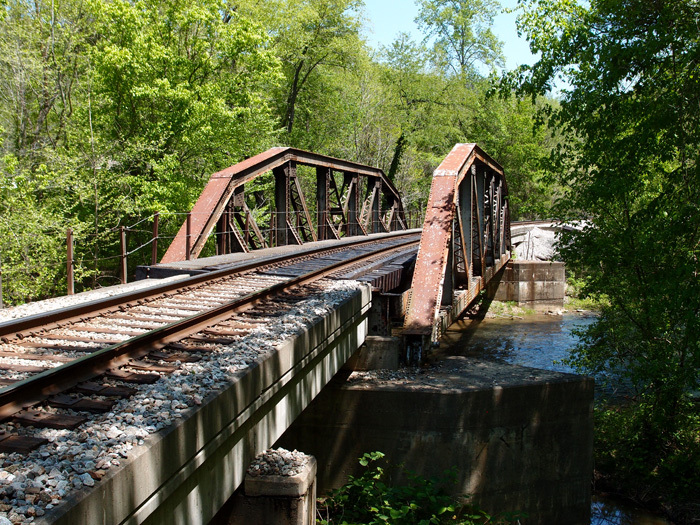 This is a 1910 Louisville Bridge and Iron Company pony girder just off 421 going into Harlan from the south. 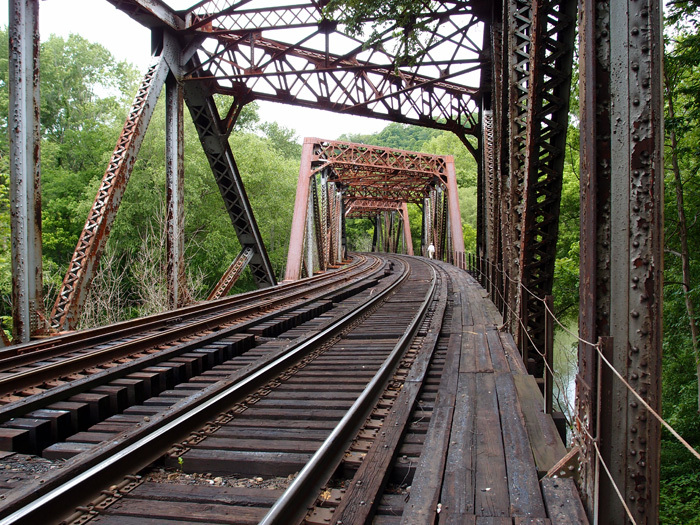 CSX now owns this former Louisville & Nashville bridge over Martin’s Fork River. Beyond the bridge you can see the huge door that closes off this area in the event of flooding (which Harlan was very susceptible to)…it’s part of a 5,000′ long wall that protects the city from rising water. The flooding used to be worse, before they cut the three large tunnels to divert the Clover Fork River to near Baxter (see the tunnels here). 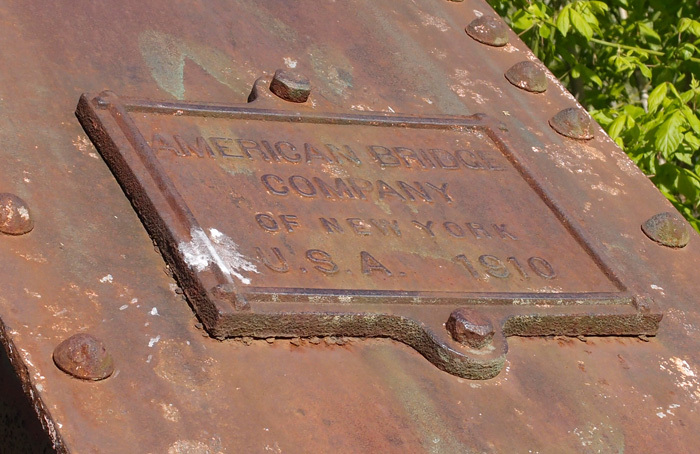 These two open camelback truss bridges, made by “American Bridge Co. of New York U.S.A. 1910” (the plates are the same on both…they’ve survived for 104 years!) are located on a dead L&N line that came out of Cawood KY and joined a line that came from Three-Point KY and moved on to Harlen and, probably, Baxter. The date is right to the line. I don’t know when this line went dead, but both these bridges have been converted to pedestrian use (people walked through the wet cement, scrawled their names and initials, but a date? Not going to happen.) This was part of the Cumberland Valley extension of the L&N that, through interchanges and leasing, heads Lynch and beyond (“To infinity and beyond!“). This one’s just outside Cawood at 36.78422, -83.23707, looking generally west.